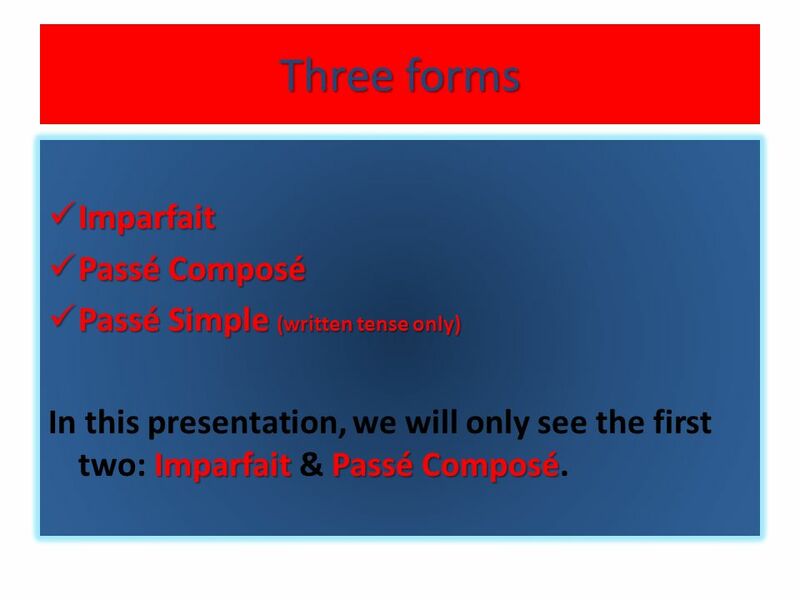 In this presentation, we will only see the first two: Imparfait & Passé Composé. What is the difference? 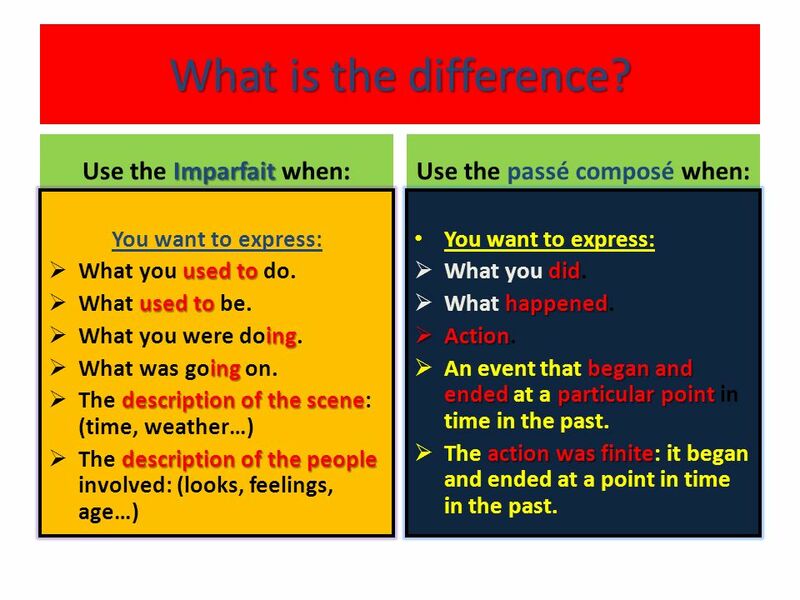 Use the Imparfait when: Use the passé composé when: You want to express: What you used to do. What used to be. What you were doing. What was going on. The description of the scene: (time, weather…) The description of the people involved: (looks, feelings, age…) You want to express: What you did. What happened. Action. An event that began and ended at a particular point in time in the past. The action was finite: it began and ended at a point in time in the past. 4 What does the imparfait look like? 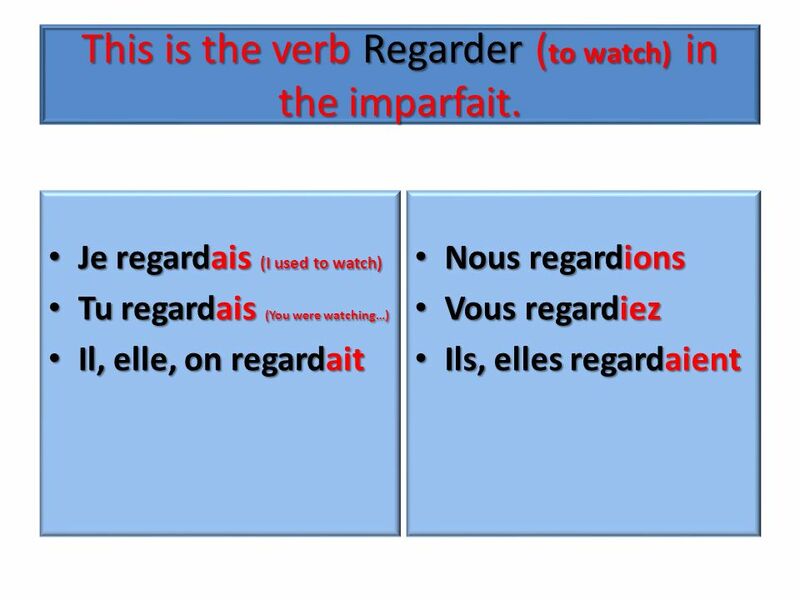 5 This is the verb Regarder (to watch) in the imparfait. 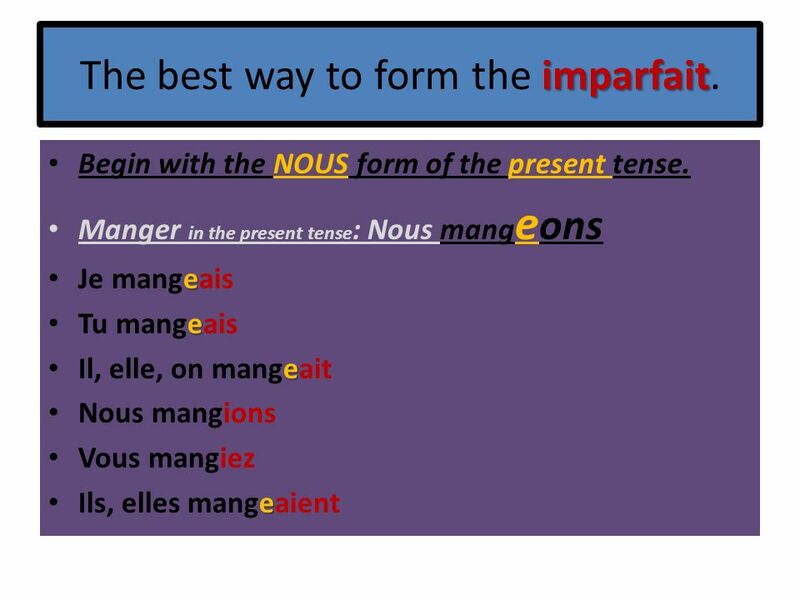 6 The best way to form the imparfait. 7 Je mangeais au restaurant. 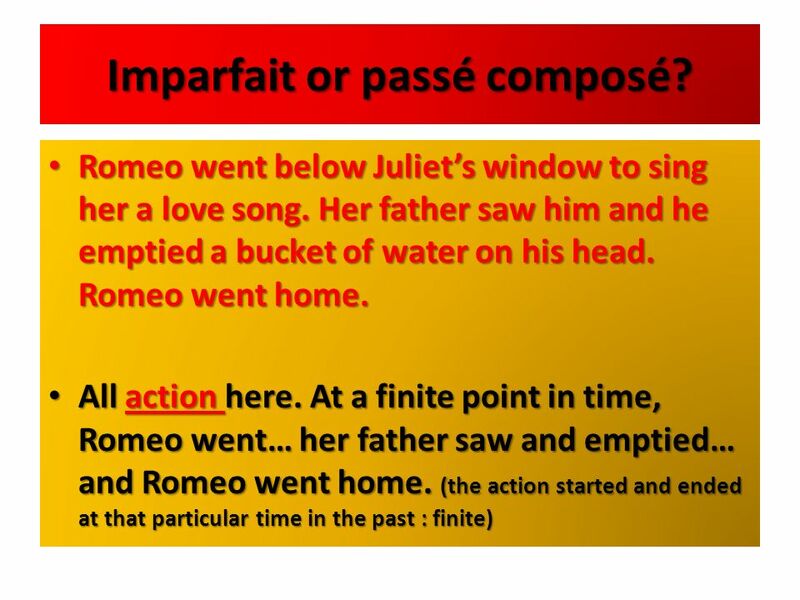 9 What does the passé composé look like? 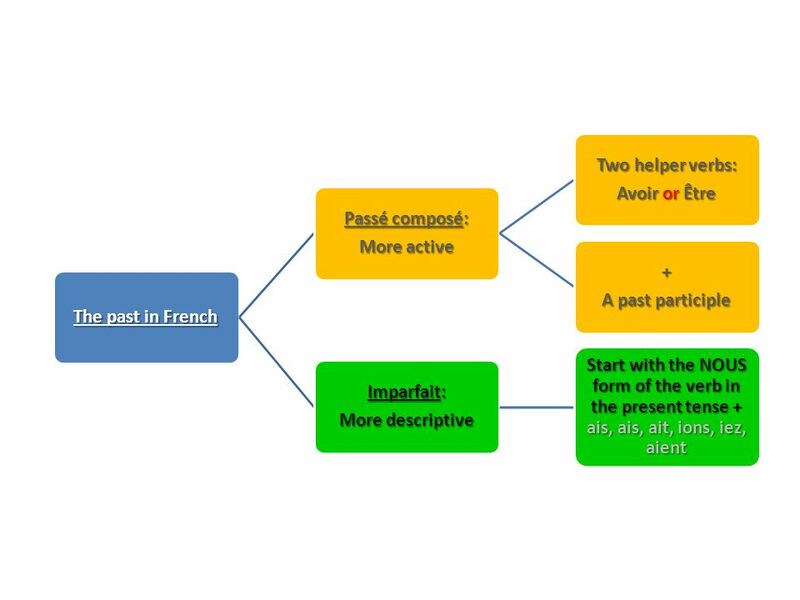 The passé composé will have 2 words, just like it’s name. 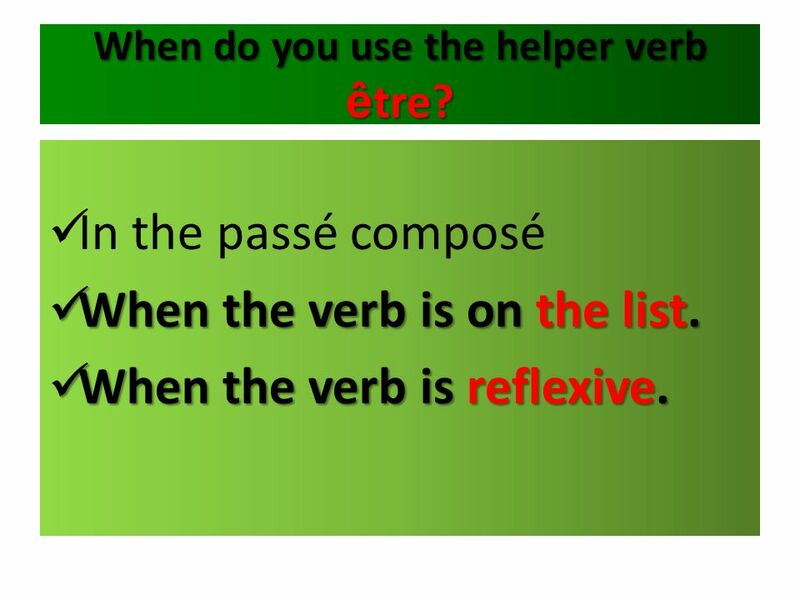 The first is the helper verb or auxiliary verb. The second is the past participle. 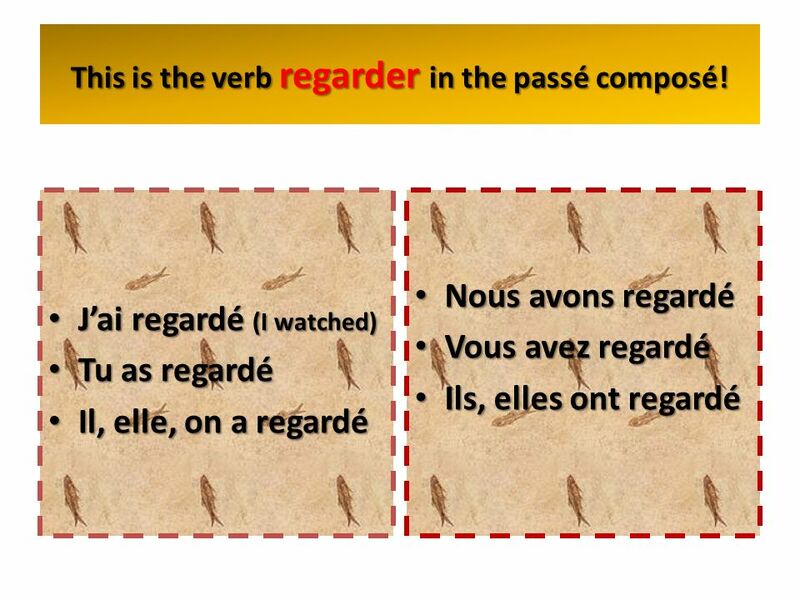 10 This is the verb regarder in the passé composé! 11 J’ai regardé un bon film. 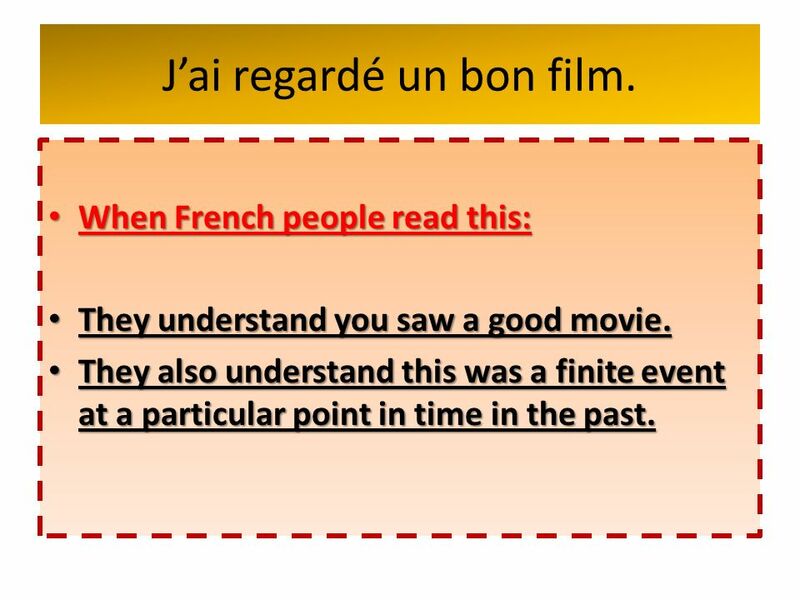 When French people read this: They understand you saw a good movie. They also understand this was a finite event at a particular point in time in the past. 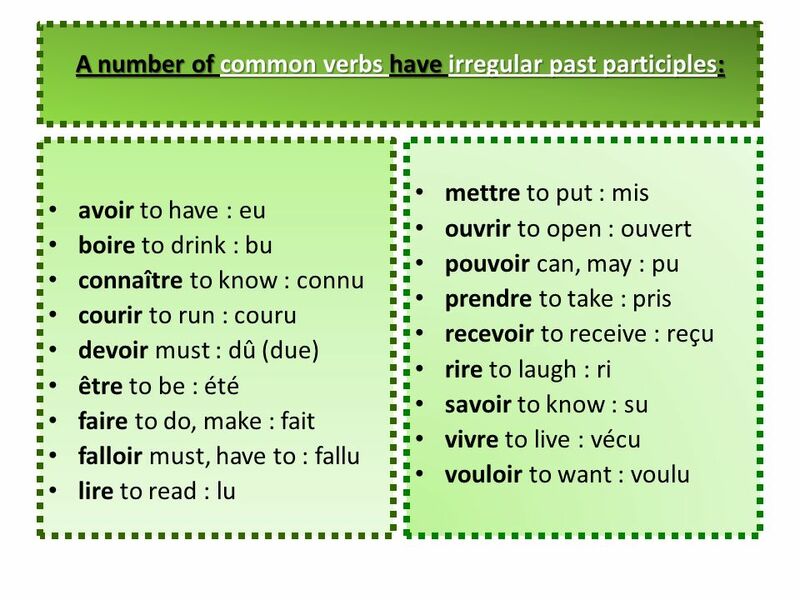 12 Regardé is the past participle. 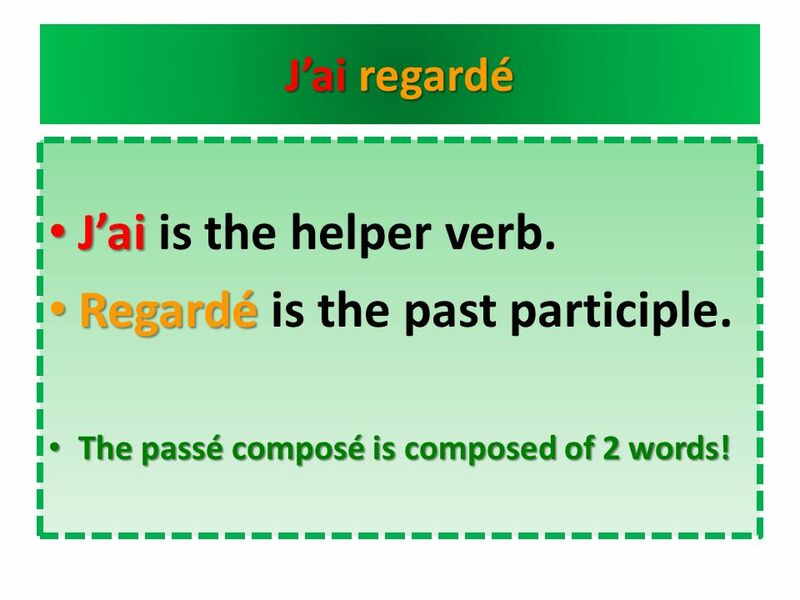 J’ai regardé J’ai is the helper verb. Regardé is the past participle. 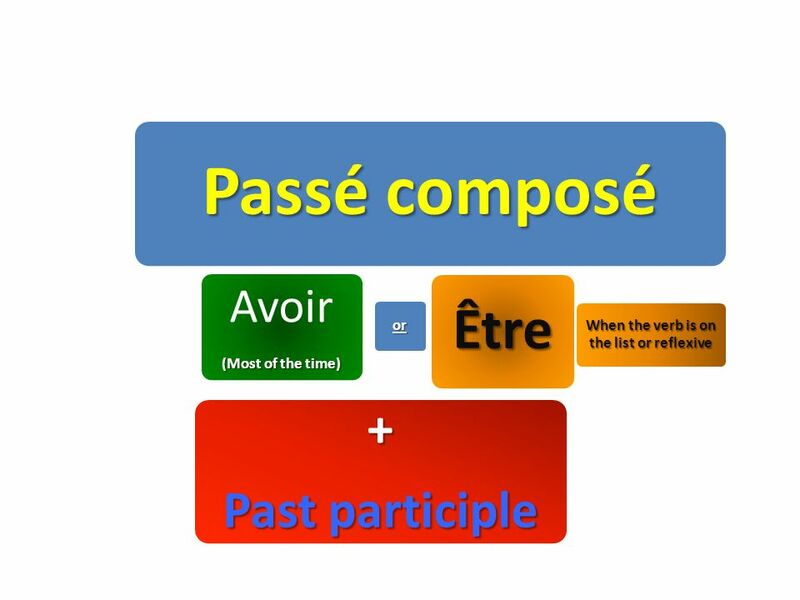 The passé composé is composed of 2 words! 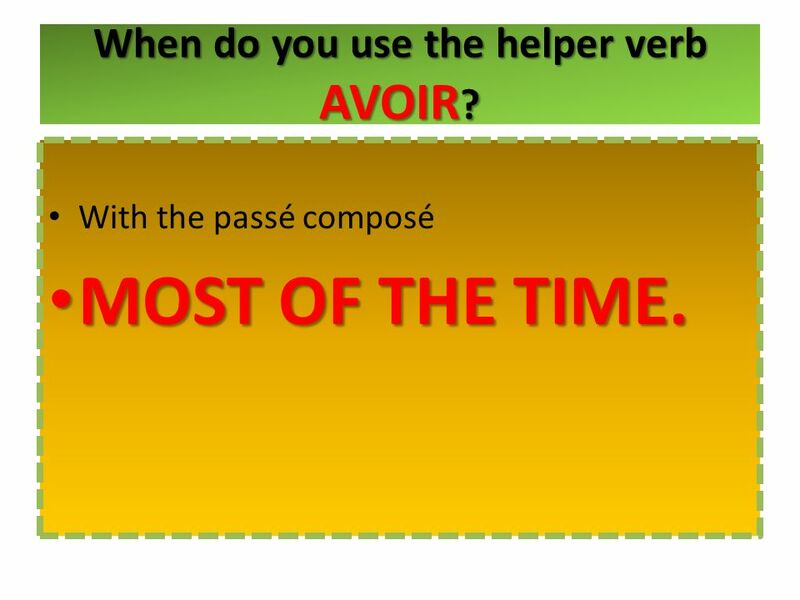 14 When do you use the helper verb AVOIR? With the passé composé MOST OF THE TIME. 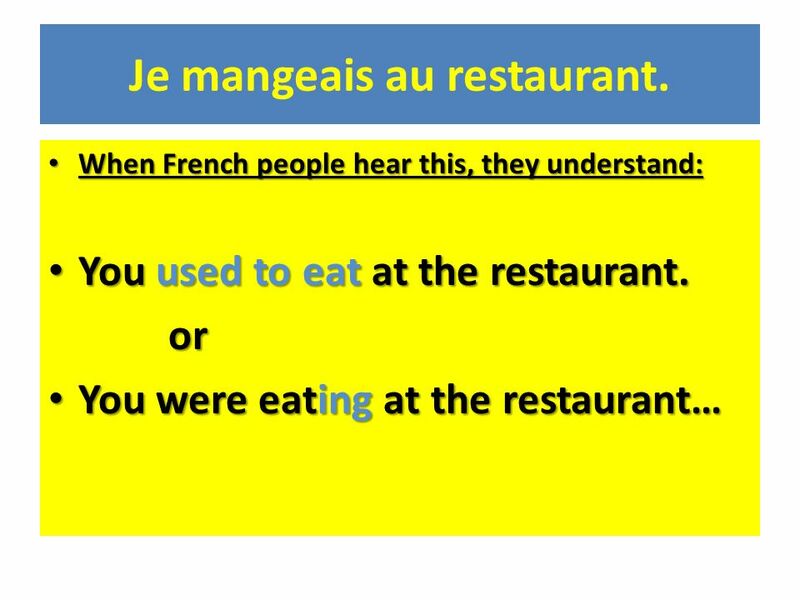 15 When do you use the helper verb être? 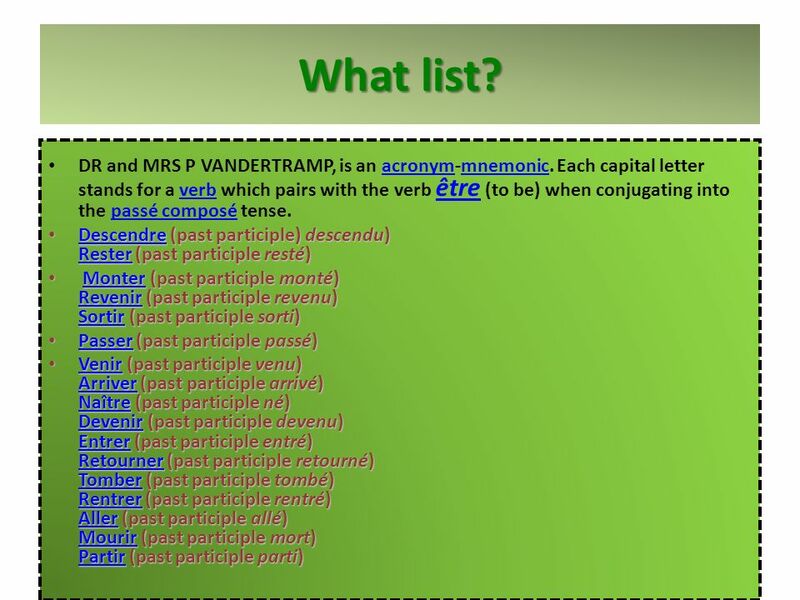 In the passé composé When the verb is on the list. When the verb is reflexive. 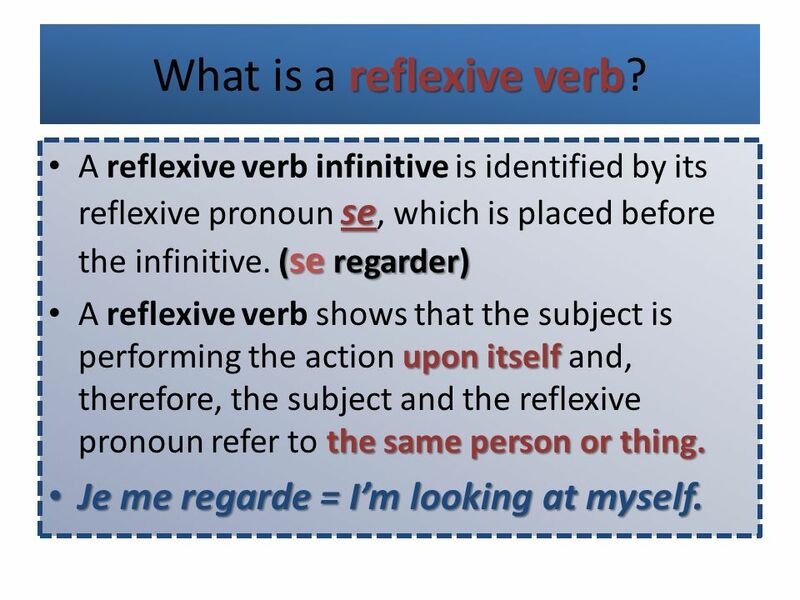 18 What is a reflexive verb? 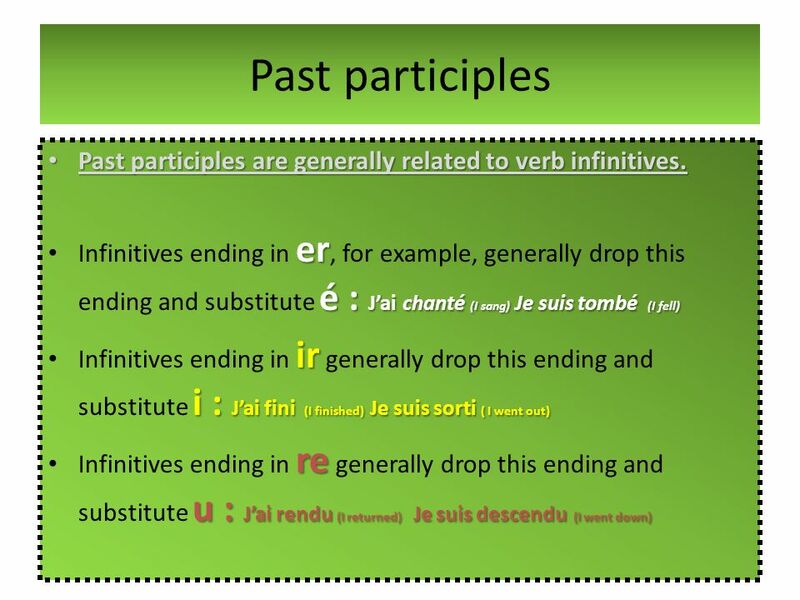 A reflexive verb infinitive is identified by its reflexive pronoun se, which is placed before the infinitive. (se regarder) A reflexive verb shows that the subject is performing the action upon itself and, therefore, the subject and the reflexive pronoun refer to the same person or thing. Je me regarde = I’m looking at myself. 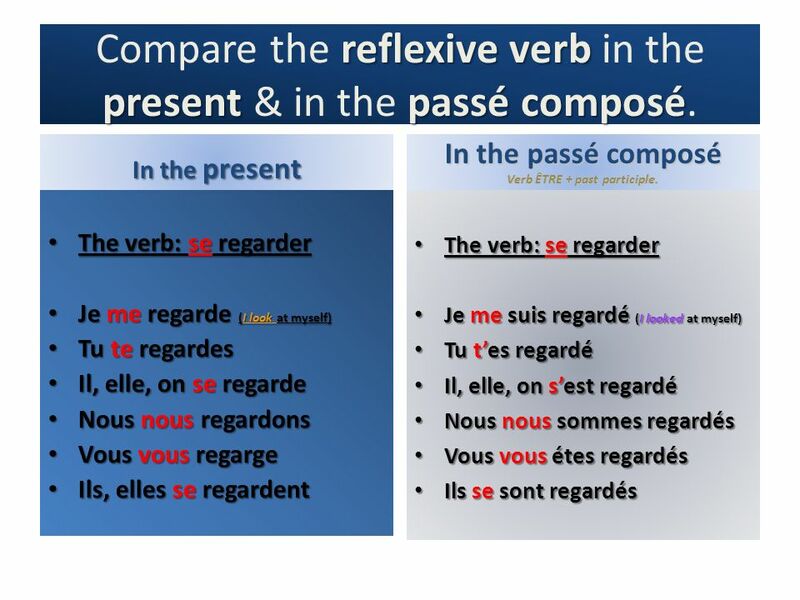 19 Compare the reflexive verb in the present & in the passé composé. 20 But what about the past participle? 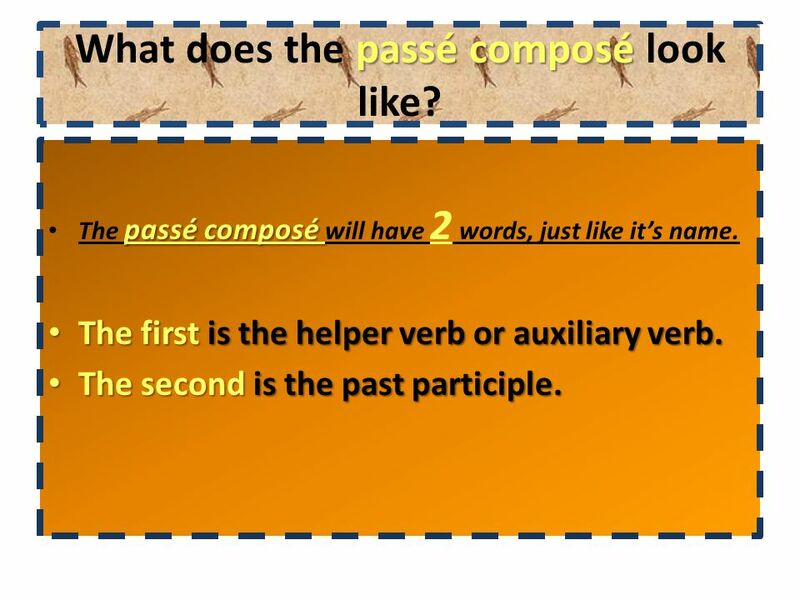 Okay so… The passé composé is composed of 2 words: The helper (auxiliary) verb & the past participle. 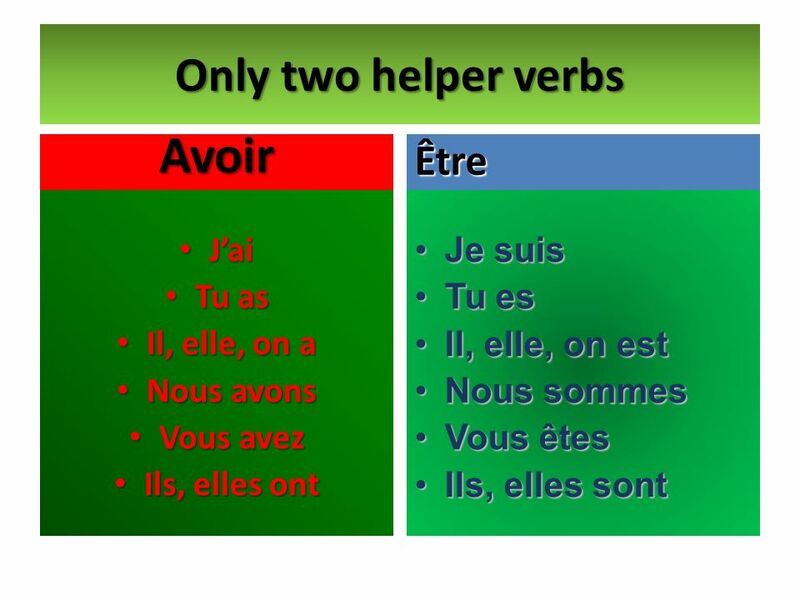 There are two helper verbs: Avoir and Être. 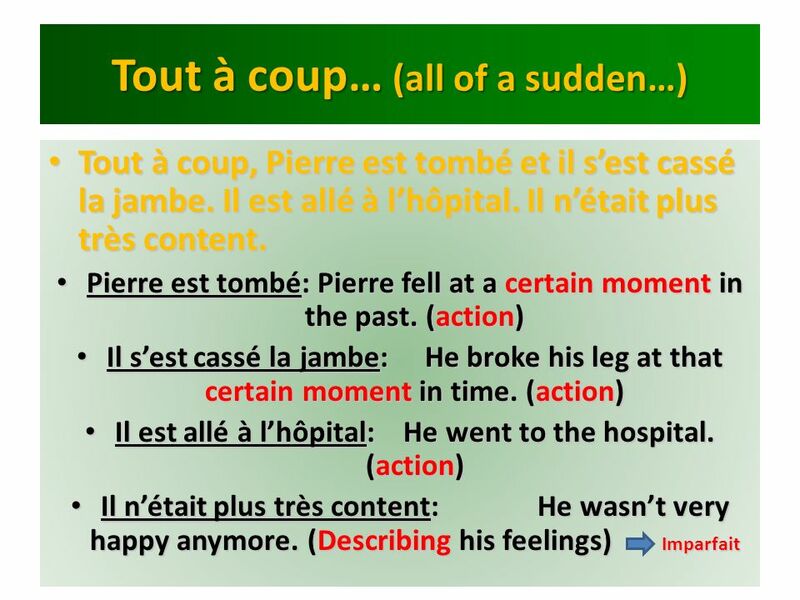 Use avoir most of the time. 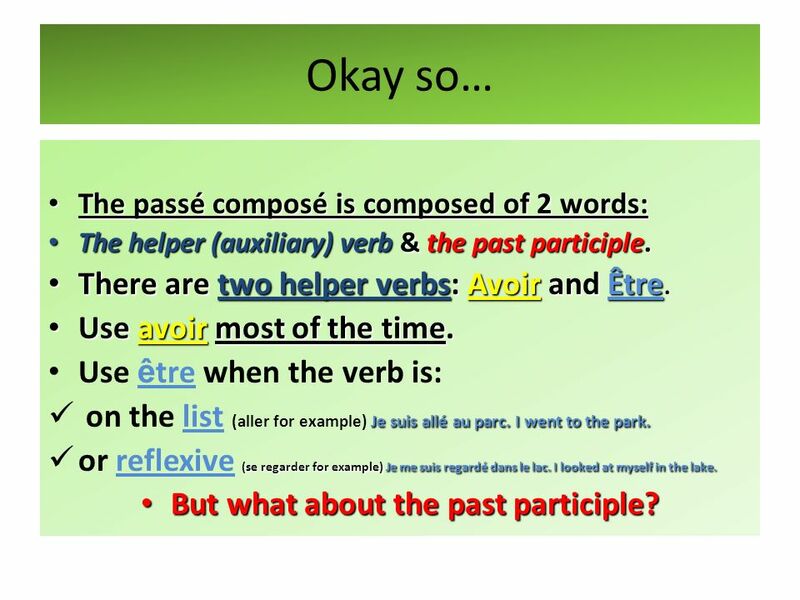 Use être when the verb is: on the list (aller for example) Je suis allé au parc. I went to the park. or reflexive (se regarder for example) Je me suis regardé dans le lac. I looked at myself in the lake. But what about the past participle? 24 A) Il a chanté une belle chanson. B) Elle chantait très bien. 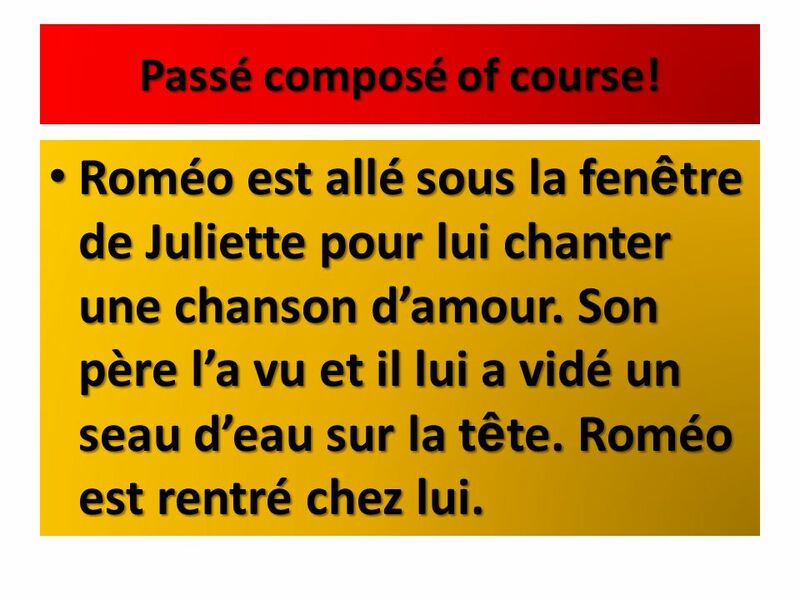 In A): When I see the passé composé, I understand: He sang a nice song at a particular moment in the past. 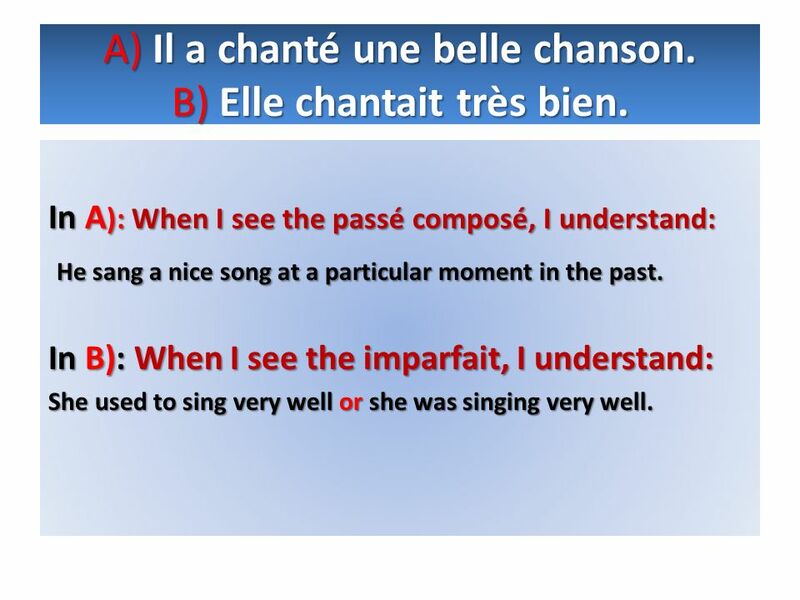 In B): When I see the imparfait, I understand: She used to sing very well or she was singing very well. 25 Un jour… Un jour je suis allé au parc et j’ai vu un joli petit lapin. J’ai attrapé le petit lapin et je l’ai apporté chez moi. Je l’ai donné à ma maman. Only the passé composé is used here because I’m all action. Also, the action is finite (It began and ended at that point in time). One day, I went to the parc and I saw a cute little rabbit. I caught the little rabbit and I brought it home. I gave it to my mom. If I had described the rabbit or my mother’s reaction, I would have use the imparfait: Il était blanc et elle était furieuse. (It was white and she was furious) Note: None of the verbs are used to describe the rabbit although I do know it was little and cute. Il faisait beau et la ville était très calme. Les oiseaux chantaient et Pierre était heureux. Only the imparfait is used because I am entirely descriptive. The weather was nice and the town was very clam. The birds were singing, and Peter was happy. 28 Imparfait or passé composé? It was 4:30 in the afternoon. The weather was nice. A man was walking towards me. He was big and scary looking. I was afraid. Describing the scene, the man and the way I felt. 29 Imparfait of course! Il était quatre heures et demie de l’après-midi. Il faisait beau. Un homme marchait vers moi. Il était grand et épeurant. J’avais peur. 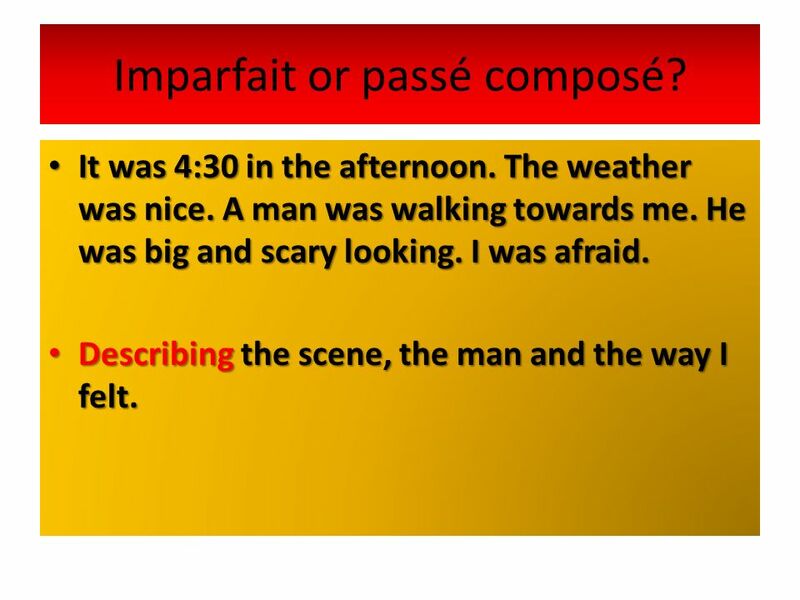 30 Imparfait or passé composé? 31 Passé composé of course! Roméo est allé sous la fenêtre de Juliette pour lui chanter une chanson d’amour. Son père l’a vu et il lui a vidé un seau d’eau sur la tête. Roméo est rentré chez lui. Télécharger ppt "Imparfait et Passé Composé"
The Adventures of Helios and Eos: The Mountain By Aurora Morton and Katherine Minski. Une Petite Révision. P.C. Completed past action one action A series of completed actions to move a story along. Le Passé Composé With Être. 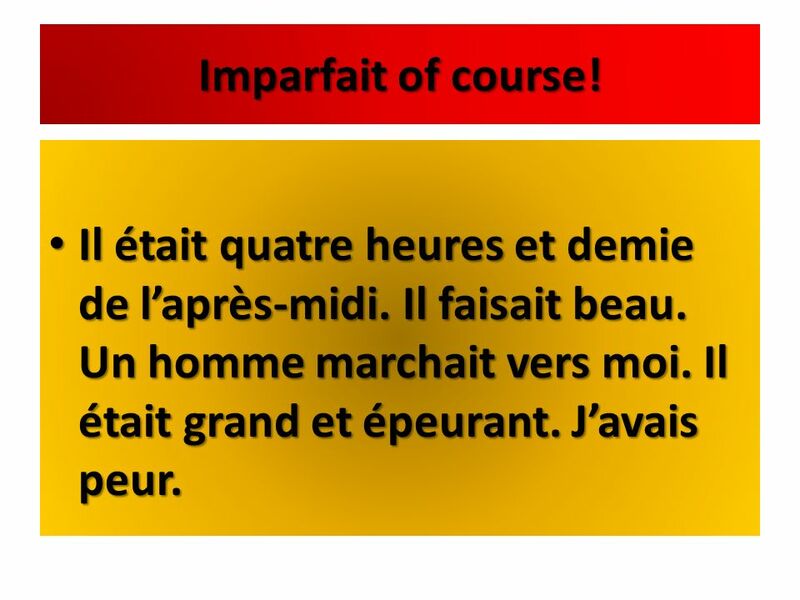 Passé Composé NOTE: the participle agrees with the subject ONLY when using être. For Example: Elles (ne) sont (pas) sorties avec une copine Elles (n) ont. Dr. & Mrs. P Vandertramp Study tricks!. 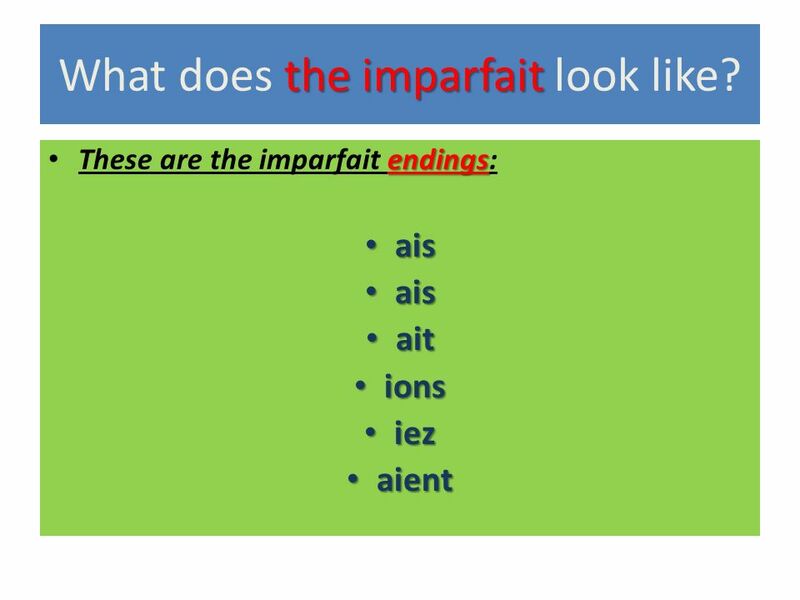 Limparfait (The Imperfect Tense) What is the Imperfect Tense ? 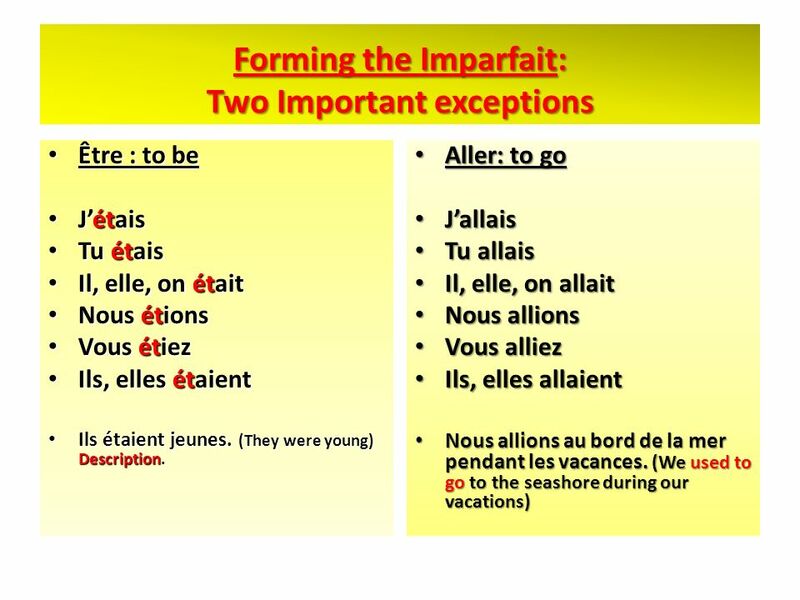 The imperfect tense is used to talk about ongoing or habitual actions which happened in. 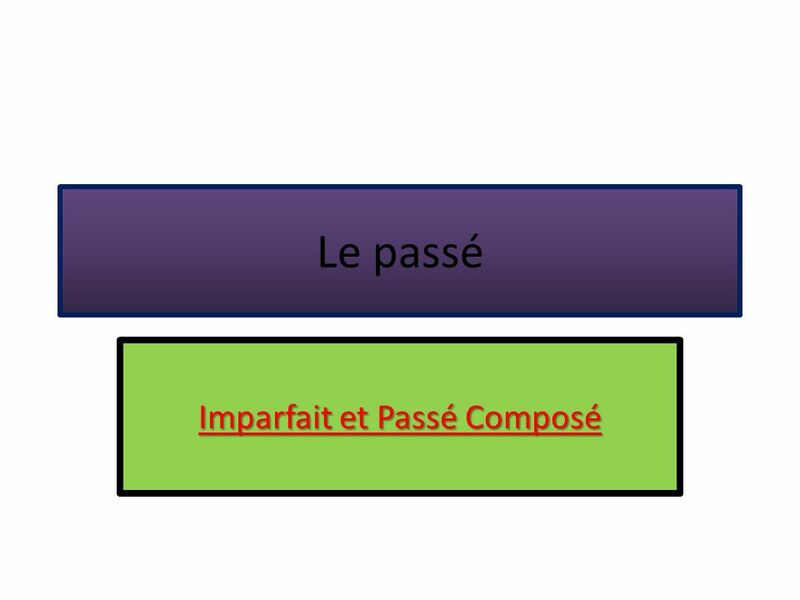 Le passé composé (the ‘perfect’ tense). 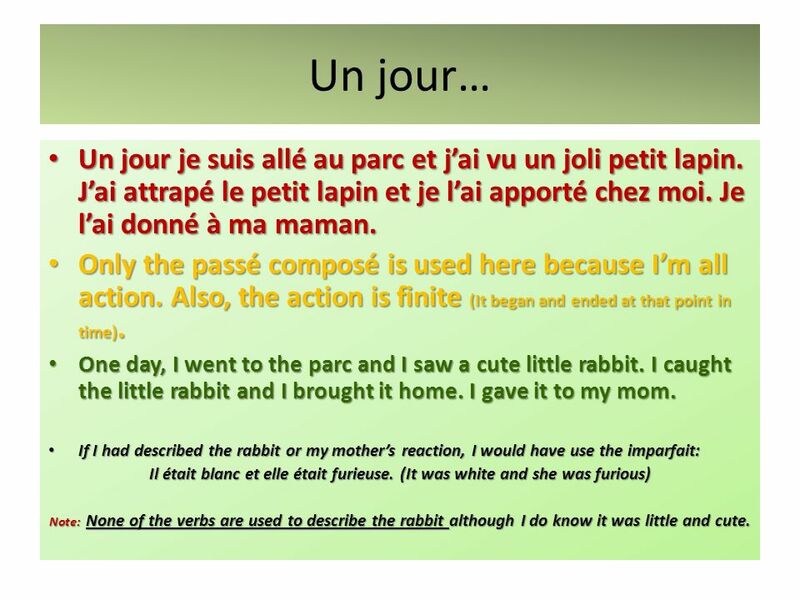 Les Verbes au Présent (The Present Tense) What is the Present Tense ? 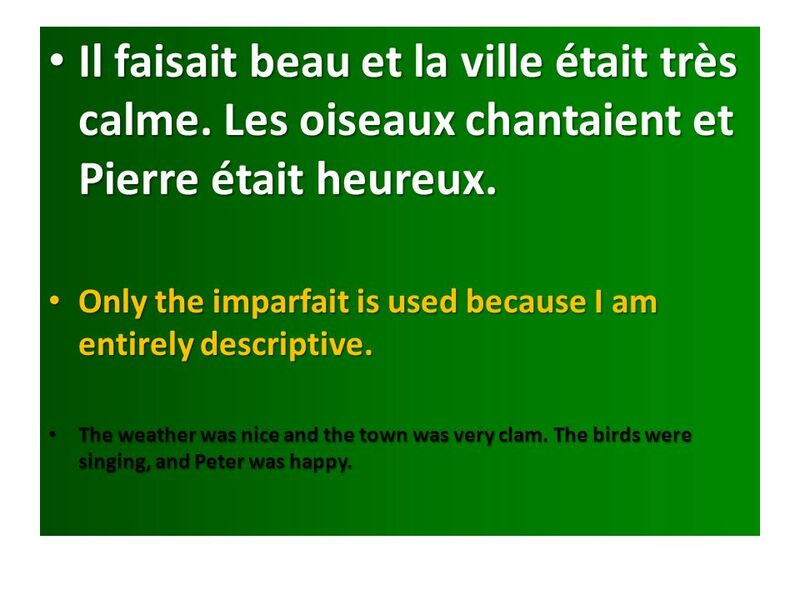 In English and in French the present tense is used to talk about things which are.